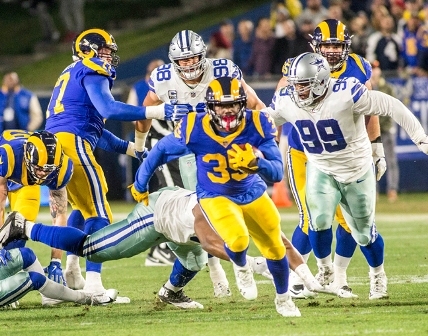 The Los Angeles Rams are one game away from Super Bowl glory after they defeated the Dallas Cowboys 30-22. They will travel to face the New Orleans Saints on January 20 for the NFC Championship. The Kansas City Chiefs will battle the New England Patriots in the AFC Championship. The conference championships are rematches of in-season games. The Saints gave the Rams their first loss of the season 45-35. The Chiefs fell to the Patriots 43-40. Rams quarterback Jared Goff completed 15 passes for 186 yards, running back C.J. Anderson made 23 rushes for 123 yards and two touchdowns and wide receiver Robert Woods had six receptions for 186 yards. 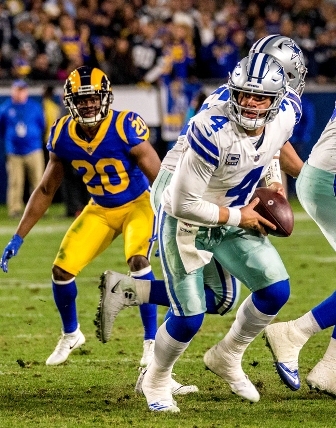 Cowboys signal caller Dak Prescott made 20 passes 266 yards, running back Ezekiel Elliott made 20 rushes for 47 yards and wide receiver Michael Gallup executed six catches for 119 yards. Rams defensive tackle Ndamukong Suh expressed how shutting down Elliott was the goal for the Rams defense. Wideout Amari Cooper was the first to score for the Cowboys, taking a short pass from Prescott to commit a 29-yard score. The Los Angeles offense reached the Dallas redzone twice but could only secure field goals. This put the Rams within one point of Dallas. The offensive line was a catalyst for successful rushing plays in the second quarter. Anderson edged their score up to 13 with his first touchdown. On their next possession, Rams running back Todd Gurley scored off of a 35-yard run. The Rams left the first half with a 20-7 lead. Dallas found a way to get back in the game with their long passes and a rushing touchdown by Elliott. Prescott connected with Gallup twice during their scoring possession. Elliot rushed in to score on a one-yard drive and the Cowboys executed a successful two-point conversion, notching their score up to 15. With passes to Woods and carries by wideout Brandin Cooks and Anderson, the Rams scored again and had a 15-point lead with 7:36 left in regulation. Dallas remained competitive, Prescott targeted Gallup, Cooper and Elliott to progress down the field. A penalty on Los Angeles converted a fourth down to a first down for Dallas. Prescott made the final touchdown of the game from a one-yard rush.